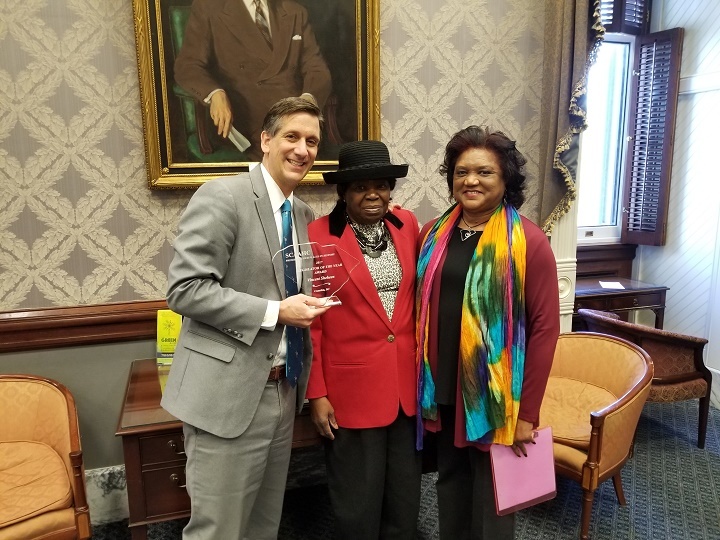 The South Carolina African American Heritage Commission presented its inaugural Preserving our Places in History Legislator of the Year Award to Sen. Vincent Sheheen of Camden, representing the 27th District. Sen. Sheheen was instrumental in securing funding in fiscal year 2016-17 for the Commission’s heritage tourism project, which culminated in the development of the Green Book of South Carolina, the state’s first online travel guide to African American historic places in South Carolina. The Green Book lists more than 300 sites associated with African American history including markers, districts, churches, schools, historic sites, cemeteries, museums and cultural attractions. Presenting the award were Jannie Harriot, vice chairperson of the Commission, and Strauss Moore Shiple of the Olde English District Tourism Commission and an ex-officio member of the Commission. This award recognizes a legislator who has endorsed the preservation of African American history and culture in South Carolina and / or solicited funding through the South Carolina Legislature for causes, groups or organizations that support the preservation of African American history and culture in South Carolina in 2017. Sen. Sheheen has been a member of the South Carolina Senate for 12 years, and a member of the State Legislature for a total of 15. Born and raised in Camden, he completed his undergraduate work at Clemson University and then attended law school at the University of South Carolina. Through the years, this public servant has been named “Legislator of the Year” by several groups including the South Carolina Solicitors’ Association for his work on behalf of law enforcement, the Wild Turkey Federation for his efforts to protect our natural resources, and the Recreation and Parks Association for his work on behalf of South Carolina’s children. However, it is some of his most recent work that causes us to honor him here today. In 2016, as a member of the Senate Finance Committee, Sheheen championed the placement of $100,000 into the Department of Archives and History budget for the South Carolina African American Heritage Commission. Recognizing and realizing the value of the many areas in South Carolina’s Undiscovered Country, he led the fight because in his words “It was good for rural counties.” Members of the Commission met with this legislator and began the work. The work resulted in the creation and launch in 2017 of the Green Book of South Carolina, the first mobile travel guide to African American cultural sites across South Carolina. It offers residents and visitors from around the world a user-friendly guide to discovering and celebrating enriching cultural experiences across the state of South Carolina. Because the Green Book includes multiple listings from all of the state’s 46 counties, it does indeed meet our legislator’s mandate that it be “good for rural counties” as well as the more metropolitan and coastal areas. Representing the 27th district, encompassing Chesterfield, Kershaw and Lancaster counties (all rural counties,) we are honored to name Sen. Vincent Sheheen as the 2017 and inaugural recipient of the Preserving Our Places in History Legislator of the Year Award.